It is hard to escape the melancholy which imbues this painting. 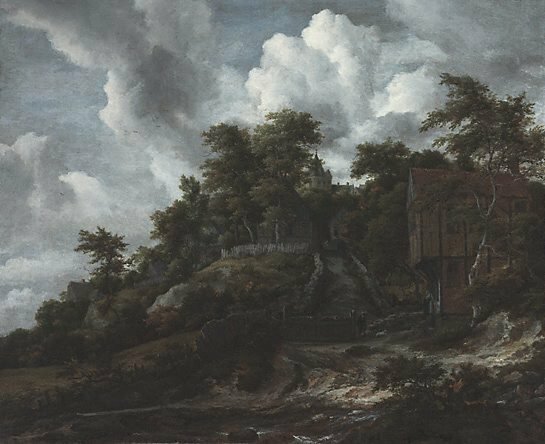 Indeed, a significant part of the appeal of van Ruisdael to his many English and Continental collectors was just this sense of sad foreboding, of abandonment and uneasy calm. Such works were a source of inspiration, and affirmation, to a later generation of romantic painters. Constable was particularly taken with van Ruisdael's work, as were the artists of the Barbizon School. He was not simply the leading Dutch landscapist of the seventeenth century, but the most forward-looking, one might say modern, of all northern artists of his day. Van Ruisdael invested his compositions with something more than a spirit of place: it is possible to read his paintings as equivalents of mental states. 'Wooded hillside with a view of Bentheim Castle', a site he was drawn to paint on twelve occasions, is gloomy in the extreme. Yet through the shadowy foreground and steep, uninviting track, the castle itself, backlit by a burst of splendid clouds, rises like an apparition of hope. Signed l.c., oil "JvR" [artist's monogram]. Not dated. Camillo Castiglioni, pre 17 Nov 1925, Vienna/Austria, his sale, Amsterdam, 17-20 November 1925. Sold 17 November, lot no. 75 'Coteau boisé avec château fort' purchased Agnew's, 17,500 fl. James Oswald Fairfax AC, 1979-28 Oct 1991, Bowral/New South Wales/Australia, Gift of James Fairfax 1991. Purchased by James Fairfax from Agnew's 1979.